The body is 22” long. 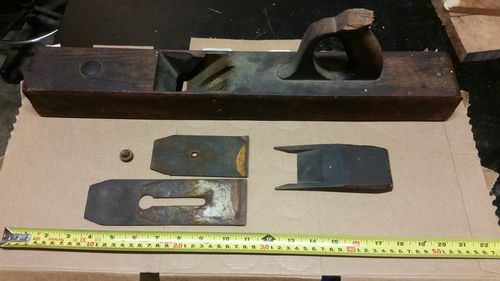 Does that make this a jack, smoother, jointer, or what kind of plane? Or does that depend on its set-up and use? The iron has a stamp which is not entirely legible but it was clearly stamped TWICE – the stamp shifted down by about 1/8” between strikes. It reads ”——-NT & CO U.S. WARRANTED CAST STEEL”. Would that be “Sargent &Co”? Is there a way for me to date this plane, or determine if there’s any particular collector value to it? I notice there is no knob, but a little button of sorts where one would be. Is that typical? Broken off and rounded down, or what? Other than rust removal and sharpening, I plan to scrape or sand the body, flatten the bottom if necessary, and get to using it. Anything else I should be thinking about or doing to it? 22” for a wooden plane is likely a fore or jointer, depending on how you set it up. A bit long for a jack. Not sure on the iron, there were quite a few makers. Extremely unlikely it has any collector value. Most wooden planes do not have knobs. The rounded part up front is a strike button. You tap the iron with a plane hammer to extend it and take a deeper cut. The strike button is tapped while holding the plane in the other hand to retract the iron slightly or struck harder to loosen the iron and wedge. It works on inertia and using the strike button saves the body of the plane from getting too banged up from the hammer. The blade could be marked Sargent. 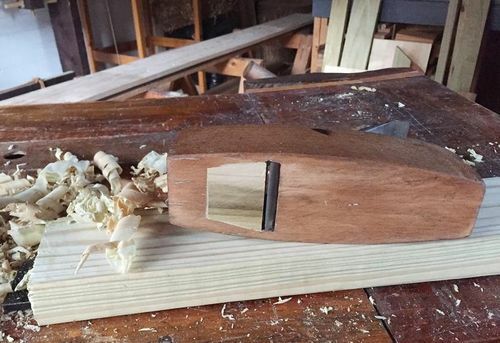 They did sell wood planes. They did not make them however. Most were actually made by Sandusky. If it’s a Sargent plane it will have a marketing on the toe. If it’s just a Sargent blade with no Mark, you may never know. Thank you both, that was very helpful. Don, the toe does have a Sargent stamp. Below the stamp appears to be the number 17, or possibly G17. There may have been more there at one time – it’s hard to make out. Any idea what model number or category this 22” plane may be? or way to estimate production date? Just so I know what I have. 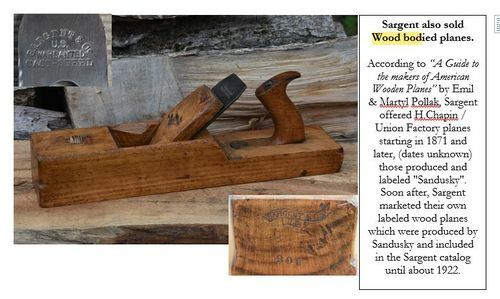 I haven’t looked into the wood bodies planes sold by Sargent very deeply, but here is what I have in my book. It may help you find something. To get clean off the grit and grime steel wool and denatured alcohol work pretty good. Thanks. Don, thanks for that page – the stamp on the iron and toe of the plane are exactly like the ones in that photo. I can reasonably infer that my plane was produced between 1871 and 1922, which is better than knowing nothing! Coincidentally I was finally starting making new totes and a wedge for them today. John, I would definitely spend the time to flatten the bottom via whatever means necessary. As to the remainder of the plane I would simply use a plane polish to clean it up, leaving the patina. The polish I use is one part boiled linseed oil, one part Murphy’s Oil Soap, and two parts bees wax. Just rub this concoction all over and it will remove the dirt and grime. I use this on my planes every couple of months. Bees wax = bees wax candle, grated, mixed with turpentine to soften to the consistency of room temperature butter. John, I would definitely spend the time to flatten the bottom via whatever means necessary. As to the remainder of the plane I would simply use a plane polish to clean it up, leaving the patina. The polish I use is one part boiled linseed oil, one part Murphy s Oil Soap, and two parts bees wax. Just rub this concoction all over and it will remove the dirt and grime. I use this on my planes every couple of months. I flattened my wooden plane on the jointer, working against the twist I had. Be careful to take minimal cuts and measure the mouth opening after every pass, seriously. If you absolutely have to, you could probably shim the rear of the plane’s mouth with very thin veneer. Doing that, however, could possibly make the wedge more difficult to use. Bottom line, go as slow as you can while flattening… Good luck! I flattened my wooden plane on the jointer, working against the twist I had. Be careful to take minimal cuts and measure the mouth opening after every pass, seriously. If you get too carried away … you might have to patch it as I had to on this coffin smoother. Thanks all for the tips! Ron, I hadn’t thought about preserving the 100-year-old patina, but you’re right – I’ll try your concoction. Not having a jointer, I’ll probably glue sandpaper to a flat piece of plywood and rub vigorously… pencil marks to show any low spots… unless y’all say otherwise. Thanks all for the tips! Ron, I hadn t thought about preserving the 100-year-old patina, but you re right – I ll try your concoction. 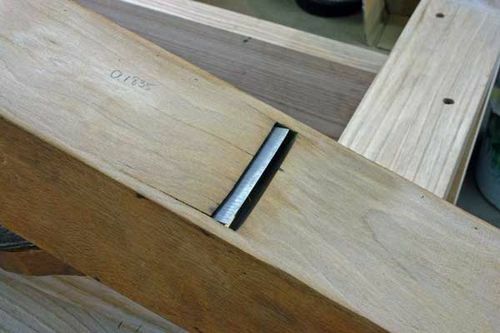 Not having a jointer, I ll probably glue sandpaper to a flat piece of plywood and rub vigorously… pencil marks to show any low spots… unless y all say otherwise. John, I think the sandpaper to a flat surface sounds like the way to go … just keep an eye on the mouth! Good luck and have fun! Of course, you will have to show more photos when you are done!